We have been established for twenty years and are experienced in the installation repair and maintenance of tail lifts both wheelchair and commercial, accessible conversions and other ancillary equipment such as steps, ramps, winches, heaters and cranes. The core of our business is our fleet of fully equipped service vehicles operating 24 hours a day, every day of the year. We are approved and authorised by all major producers, worldwide and our service technicians are all trained and have completed manufacturers’ courses. Keeping you vehicles moving is our priority and we focus on reliability and safety. 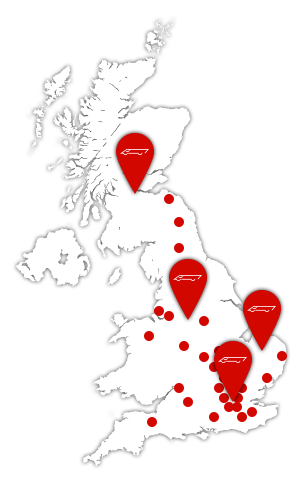 Full comprehensive service facilities are available at Cambridge, London, Manchester, Falkirk and Bristol. We provide thorough statutory testing and certification including weight testing both on and or, as is most frequent, service at the customer’s premises. We believe customer service is our most important asset, whether you are a single vehicle operator or a national fleet, you can be assured of the same high level of attention. In addition to numerous business customers we are the country’s leading specialist in mobility accessible vehicles. The emergency service ‘Blue Light’ sector is an important part of our business and we look after the fleets of East of England, West Midlands, and Hertfordshire amongst others. 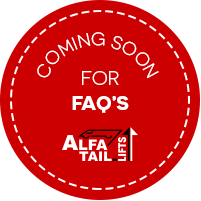 Alfa Tail Lifts understands how vital your tail lift and ancillary equipment is to you and your business and that is why we make it our business to keep you on the move. 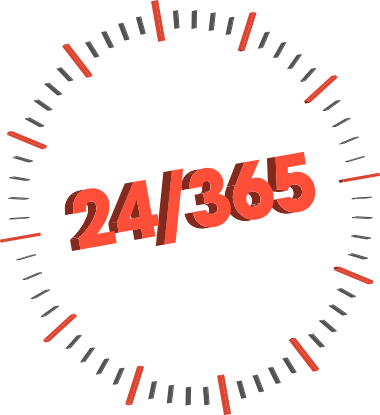 Emergency repair is our our first priority and we’re on call 24 hours a day, 365 days a year. We are fully equipped service vehicles on patrol throughout the UK to repair all makes of tail lifts, shutters, curtains and ancillary equipment, including Ratcliff Palfinger, Ricon, Del, Ross & Bonnyman, Dhollandia and Anteo. Fully equipped service vehicles on patrol throughout the UK. Most repairs carried out on-site on first visit. Fully qualified engineers - trained to deal with all types of lift emergency and breakdown. Extensive range of parts carried on board for immediate replacement. Nationwide network of qualified partners if your vehicle is outside our normal service range. 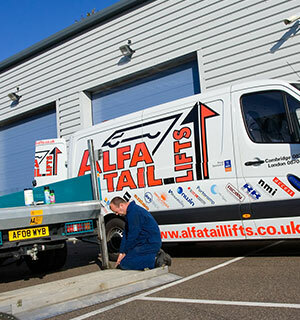 Alfa Tail Lifts provides fully comprehensive service facilities from our Cambridge and London offices. Automatic scheduled service calls or service-on-demand. Thorough statutory examinations including LOLER and weight tests using full accredited test equipment. Mandatory 6 and 12 month certification. Fully authorised and trained engineers assures quality of service. Cost effective service agreements available to fleet customers. We also offer supply, fitting and a refurbishment service to compliment your tail lift requirements. Supply and fitting of new and refurbished tail lifts for commercial and mobility vehicles. - We are authorised agents for every major manufacturer in the UK. Supply and fitting of wheelchair tracking, restraints and steps. Supply and fitting of shutters, curtains and loadlock restraints. Supply and fitting of landing legs and demount docking. Technical support and contacts for tail lift and mobility customers. Impartial advice on the type of new lift, shutter, curtain, step etc. to fit your individual requirements. We hold a wide range of tail lift, shutter, step, heaters, winches and ramp parts in stock for most equipment manufacturers and offer a prompt parts facility. More than 10,000 parts held in stock. Most items shipped same day for orders received by 4pm. Standard next working day delivery. Dedicated parts order line and administration. All parts covered by manufacturer’s warranty. Order tracking and reporting available for contract customers. Alfa Tail Lifts Ltd is rapidly expanding and we are always looking to recruit engineers with hydraulic and electrical skills. If you would like further information please do not hesitate to either call or email cambridge@alfataillifts.co.uk. Full training will be given to successful applicants. Two important sets of regulations apply to the supply and maintenance of tail lifts and supporting equipment. Full details of the requirements of PUWER & LOLER are contained in the Health & Safety Executive's Approved Code of Practice. Alfa Tail Lifts provides full certification in compliance with HSE guidelines. Alfa Tail Lift's 6 monthly thorough statutory examination and certification ensures that your vehicle(s) meet all necessary legal regulations. Testing is MANDATORY for many classes of vehicle. For service calls in Eastern and Northern UK, accounts, personnel and general enquiries. For service calls in London, Southern and Western UK. For service calls in Scotland area. For service calls in the North of England.